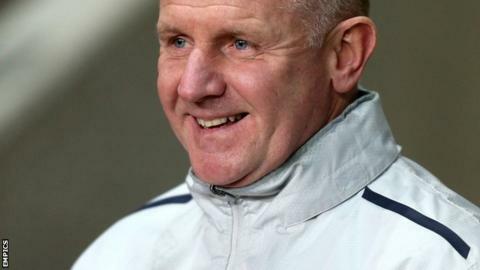 Tranmere are faced with the "worst scenario" as they bid to escape relegation from League One, says caretaker manager John McMahon. Rovers, who last played in the fourth tier in 1988-89, will be relegated if they lose to Bradford on Saturday. "The only thing we can do is win our game," he told BBC Radio Merseyside. "It's the worst scenario that you can go into, but it's a game we go into knowing we have to win. If there's someone smiling down on us, fantastic." Defeat at Leyton Orient left Tranmere fourth from bottom, a point from safety. There are two relegation spots still to be filled, with Notts County, Crewe, Tranmere and Carlisle - who have a game in hand on all of their rivals, but are three points behind Rovers - all hoping to avoid the drop. Even if Tranmere beat the Bantams, results elsewhere could send them down, but in a complicated scenario, a draw could be good enough to keep them up. However, McMahon - who has been in temporary charge at Prenton Park since manager Ronnie Moore was suspended and then sacked by the club after admitting breaching the FA's rules on betting - says victory is their prime objective. "We're at home and I'm calling on the spectators to come down in numbers and really get behind the players - they will give it everything they've got," he added. "We've got to be disciplined. We can't just play six or seven up front. We need to play with our heads as well as our hearts. "There's a stigma that goes with relegation. I don't want to be labelled with that and the players don't want to be labelled with that. It's up to us, as a group, to not let that happen."